Dr. Derek and his wife Casey in the Asheville mountains! Dr. Derek grew up in the Milwaukee area and after 15 years of pills, poking, and prodding – and no relief from the issues – he found chiropractic. And it worked! After graduating from Palmer College, Dr. Derek stuck around the midwest and got a lot of practice caring for people who typically didn’t care for themselves very well. He learned a lot in those years caring for the elderly, college athletes with sports injuries, and hard working adults with chronic pain issues. Bringing relief to so many was very rewarding. Dr. Derek and his daughter. 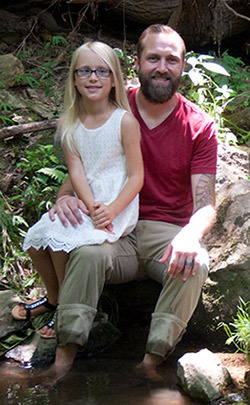 After his own daughter experienced a traumatic birth and suffered from colic and constipation, he was able to see how chiropractic helped her nervous system calm down and find balance. He also saw the rise in chronic conditions in his own community, so he slowly began to expand his focus to include pediatrics, prenatal care and neurodevelopmental disorders like ADHD, Sensory Integration Disorder and Asperger’s. Passionate about children, and wanting to care for entire families, Dr. Derek began to pursue his certification in pediatrics and Webster’s Technique from the ICPA. 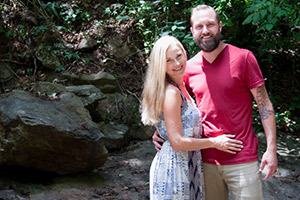 After focusing on pediatrics, prenatal care and family wellness in the midwest for the last five years, Dr. Derek decided to make the move to Asheville in 2014 to open One Love Chiropractic. Dr. Derek and his wife have family in the Asheville area and they feel that Asheville is a perfect place to allow their family to grow. You can download a free copy of his ebook titled Indifference: Why Our Children Are So Sick. Click here for more information. Dr. Derek and his family. 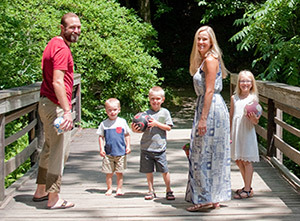 Dr. Derek and his wife Casey have three children Layla, Tate and Lennon, and a dog named Link. Growing up in Milwaukee, they love their sports teams! You may catch them cheering for the Packers and Brewers. Dr. Derek has always been an avid soccer player playing college for both UW-Milwaukee and UW-Oshkosh were he was a first team All American. He also played for professional and high level club teams such as the Milwaukee Wave United, FC Indiana and the former ameuter national champion Croatian Eagles. He hopes to join a competitive team here in Asheville even though he is a bit past his prime. As a family, The Kasten’s love playing outdoors – they enjoy hiking, mountain climbing, and camping every chance they get. Wondering how chiropractic might help you? Contact us today.